Hyderabad: The hottest download in town seems to be Bathukamma songs that are pepping up the festival season with several private music albums and television news channels competing against each other to come up with the best song. In addition to the large number of downloads, there is a huge jump in the number of persons who are viewing Bathukamma video songs. Interestingly, this year, almost all new channels have produced and released their own special signature Bathukamma songs. 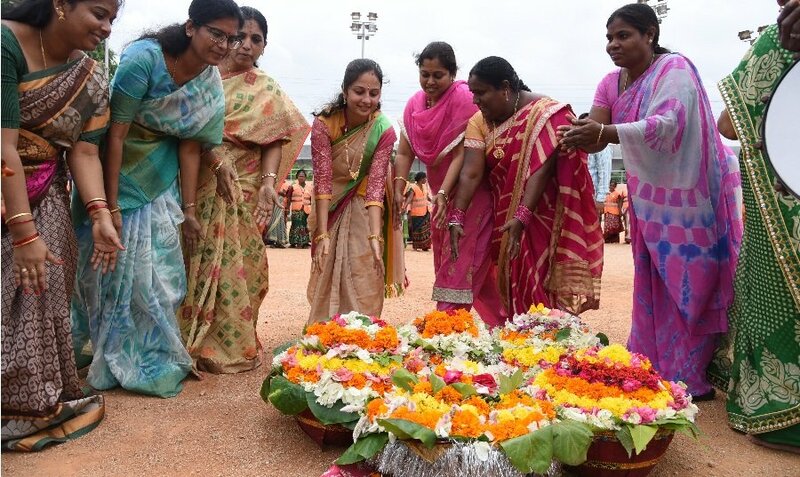 In fact, over a million views were recorded by several news channels on the first two days of the Bathukamma festival. The number of views for the Bathukamma songs produced by V6 news channel reached 1.8 million views, while that of Mic TV, which featured anchor Kathi Karthika, touched 3.1 million views. The special song produced by T News featuring Udayabhanu garnered as many as over four lakh views while the song by HMTV garnered close to 1.92 lakh views as on Thursday. The songs have now become a part of celebrations in apartments and parks where families turn up in large numbers for Bathukamma events. ‘Yavanna oyalalo gobemalalalo…’, borrowed from the village dialect of women in Telangana, and used in the T-news song, have become quite popular this year. “The lyrics are a hit because they reflect rural Telangana,” says B Purnachander, song director of the T news Bathukamma song. Almost all the songs are available free for viewing and download, which is an added attraction for people. “Bathukamma folk songs will further help the next generation to have an idea on the dialect of Telangana. This is for the first time that there are so many choices in terms of Bathukamma songs,” says Aderla Divya, a resident of Vivekananda Nagar.